Ringling Bros. and Barnum and Bailey Circus is no stranger to criticism that it puts profits and efficiency before the welfare of its performing elephants, but now the animals are being denied one of the few semblances of freedom they had left. 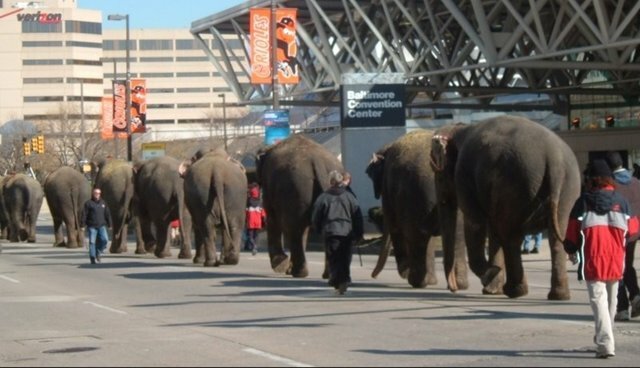 For years, the Ringling Bros. had organized so-called 'elephant walks' whereby the captive animals were given a brief reprieve from their cramped quarters and allowed a taste of the open air after long train rides by carrying themselves the short distance to from rail stations to the venue where they were set to be performing. "Its an important thing for the elephants," said circus trainer Joey Frisco III, prior to one such walk in 2012. "They get to stretch their legs out a little bit after riding the train." But it seems that that "important thing" is no longer so important. Recently, Ringling Bros. has begun cancelling the tradition in various cities indefinitely, citing concerns that the parade-like events are too difficult to organize. Instead, the animals are being unloaded from their transport train cars and ushered into special vehicles to carry them to other enclosures where they will be housed for days prior to each performance. "We're usually beholden to train schedules, and the elephant walk requires a lot of work and pre-planning with law enforcement, the venues and our personnel," explains circus spokesman Steve Payne to the Orange County Register. While Ringling Bros. hasn't announced a policy to cancel the walks permanently throughout each stop of the tour, the events have been scrapped several time this year already, like in Washington D.C., Virginia, Los Angeles and an upcoming event in Anaheim, California. The tradition of allowing elephants to stretch after train rides had been used as a promotional tool, as locals would inevitably gather to watch the animals parade by. But in recent years, as awareness has spread about how the circus treats its elephants, the publicized events became the site of protests from group like PETA -- which Ringling Bros. would not doubt prefer to avoid, particularly because they were effective in turning people away. "Every year when we're protesting the elephant parade and handing out information [at the venue]," said campaigner Ashley Byrne. "Every year we meet people who say it will be their last year at the circus."